It is with great pleasure that I invite the accordionists from around the world to participate in our Annual Australian International Accordion Championships and Festival. Every year it is our aim to make this international event a friendly and entertaining experience supporting our local accordionists and welcoming guests to our country. The international flavour of guest artists, contestants and festival performances make for a superb accordion celebration. As the Australian representative to the Conferation Interntationale des Accordionistes - the AATA’s premiere categories’ rules are closely aligned with the Coupe Mondiale Masters category, affording even greater possibilities of international competition for our most talented young piano accordion performers. As part of the AATA policy of making our event accessible to contestants from overseas as well as Australia, our Prospectus and rules are published online only. The most recent Prospectus is now available for viewing and candidates and teachers can print out the classes or rules that apply specifically to them. Closer to the event, the Timetable will be online detailing specific category starting times as well as the general schedule including masterclasses, social events and concert times. As part of our celebration of the accordion, our festival concludes each day with an opportunity for attendees to socialise in an informal environment where accordionists can meet and talk. Everyone is welcome. 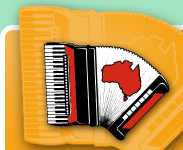 We hope that both participants and spectators will enjoy the the Australian International Accordion Championships.